Fr. Matthew Despard, formerly of St. John Ogilive's parish, has won a partial victory before the canonical courts in Rome. Fr. Despard's book, "Priesthood in Crisis" drew considerable ire from churchmen in Scotland, leading to his removal from the parish and active priesthood. The book chronicled Fr. Despard's account of the facts pertaining to a decades long ongoing homosexual infiltration (and coverup) into the priesthood in the Catholic Church in Scotland. On an appeal to Rome, the Romans have "partially reversed" the initial Scottish canonical decision. Fr. Despard has now approached Bishop Toal to receive a parish and return to active ministry. We await the bishop's response. For a background to the Scottish Crisis, as well as valuable information from on the Catholic Church in Motherwell, please read here, here and here. Montfort (one of our contributors), comes from the Diocese of Motherwell. With personal contacts in Fr Despard's diocese, we will monitor closely the situation and report to our readers as new information becomes available. It should be noted that Fr. Despard has massive support from the lay faithful. hits the sinner with the poisoned arrow of lust, but when a man carries out such a sinful act, the demons leaves. Ah it was this saint who relayed the words of Our Lord about the devils not being able to bear being around those who commit vile sins against nature and God's law. I just fielded a nasty comment from one of Father’s parishioners who claims to be slandered by his book. I’m fairly certain this individual’s real problem was Father’s witness. 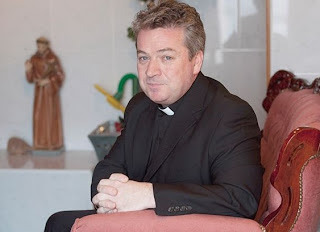 In light of current revelations in the news and Bishop Toal’s denunciation, but not suspension of an aberrosexual advocate in this clergy, is there any news of Father’s exoneration and reinstatement? I was speaking with Montfort the other week (who is in contact with the Despard family). The situation is that though Fr. Despard won his case in Rome, Bishop Toal is refusing to give Fr. Despard a ministry. Thus Fr. Despard is a priest in good standing, but with a bishop who is refusing to allow him to serve. Thanks for that! The Vicar general didn’t say anything about that.